WHO IS DRIVING THAT CAR? OH MY GOD A BEAR IS DRIVING!! 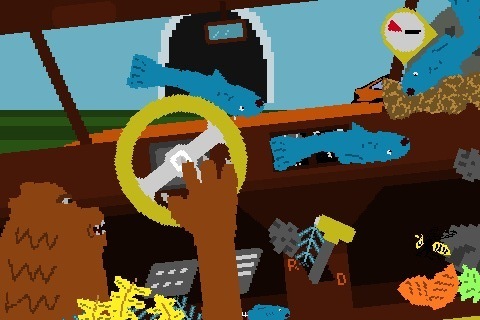 Based on a TIGSource competition entry from earlier this year (itself based on a scene from the animated Clerks series), Justin Smith has released Enviro-Bear 2010, an absurd iPhone game that’s just playable enough to warrant a purchase, and bizarre enough that you simply have to share it with friends. First thing you’ll need to do is figure out how to drive the car using one paw. Once you’ve got that covered, crash through rivers and bushes to gorge yourself on fish and berries until you’re full, and then head into a cave for the winter (and quickly, winter starts in five minutes!). Brilliant work, Justin. 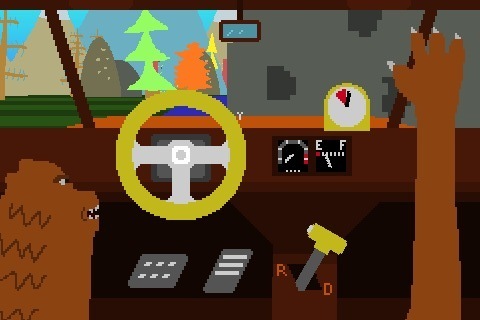 Enviro-Bear 2010 is gonna be a top ten app by the end of the week.